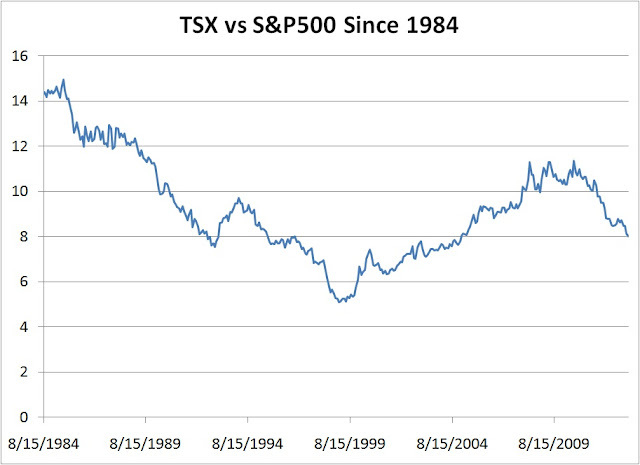 In an older post I showed data for US vs Canadian equities back to 1999 (link). I said it would be nice to have older data, which I realized I could get by not using the ETFs and instead directly dividing the TSX value by the S&P500 value on a monthly basis. For that the data is available back to 1984 (from Yahoo at least). The graph is below. One downside to this comparison is it doesn't factor in currency - if it was stated in US$, the peak would be a lot higher as it was in the ETF comparison (EWC is in US$). Regardless, the cyclicality of the Canadian economy becomes very evident in this graph!